For multi-destination trips select country most time spent in. Policy coverage and available benefits will vary based on state of residency and the initial deposit date. The early purchase benefits described above may not be available with your initial deposit date. Please refer to your policy of insurance for your specific coverage. Cover begins from the time you buy your policy. Trip Cancellation and Cancel for Any Reason coverages will be effective at 12:01am (Standard Time) on the following payment to the Company for any required plan cost. For further information see your Policy Document. Enter the age of each traveler including children. Only use as many boxes as you have travelers. The primary policyholder should be in the first box. Please select your state from the list below for the relevane Description of Coverage document. Cover-More has been providing travelers in the US, UK, Australia and New Zealand with high-quality travel insurance and round-the-clock customer service. 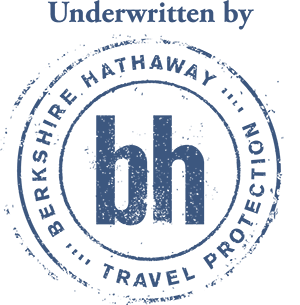 We’ve partnered with Berkshire Hathaway Travel Protection to provide our US customers with the highest quality coverage available.